I was lucky enough to get an advanced review copy of the new Sylvaneth Battletome from GW and man oh man is this book good. They took a faction that was originally just a small part of a larger army and did a fantastic job at expanding it into a full fledged army, and in my opinion, one of the most interesting and visually appealing factions in the game. The cover on this is really cool and again I will have to say I think this may be my new favorite. They keep outdoing themselves with each new cover design for the newer Battletomes. 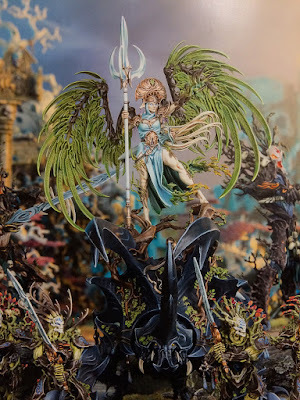 Most people have already seen this image from when it was on display at Warhammer Fest and then all over the internet, but no one knew this was going to be the cover art. The book itself is a nice sturdy hardcover and comes in at 144 pages, easily one of the thicker ones so far. The first part of the book goes over the general history of the Sylvaneth. Alarielle brought the seeds of the first Sylvaneth with her from the world-that-was and planted them within the gardens of Ghyran. During the Age of Myth they prospered like much of the rest of the races of the realms. Although they are primarily located in Ghyran, they have small enclaves all over the Mortal Realms, basically wherever a forest may be. One thing I thought was really interesting is that the Dryads and Branchwraiths we are so familiar with were once just simple citizens and not warriors. They lived in peace and pursued whatever interests they wanted, but as the Age of Chaos dawned they were forced to fight just to survive. Over time the only Dryads left were the ones tough enough to keep up the fight against Chaos. The main warriors of the Sylvaneth are the Tree-Revenants, the half aelf looking guys from the front cover. They are said to be echoes of the Protectors of old, and although it is never explicitly stated, it's heavily implied that the Protectors were the Wood Elves from the world-that-was, perhaps just the ones most heavily in tune with the woods. I think this is a rather cool way to have some aelf like elements in the army while keeping it distinct. We also get a brief recap of the Sylvaneth's story so far in the Age of Sigmar narrative with their fight against Nurgle and the "assistance" from the Hallowed Knights. After this we get the timeline showing off all of the most important moments from their history. One that caught my attention, and that is mentioned later as well, is the Shrouded Season, when Alairelle banished all of her Sons of Durthu from Ghyran. No one is sure what happened since all of the Sylvaneth have had this moment in time wiped from their collective race memory. There are a bunch of other really cool mentions of battles throughout their history. We also get to see the return of Drycha which I will get to in a bit. Just like every other book we get our section going over the various color schemes for the army. 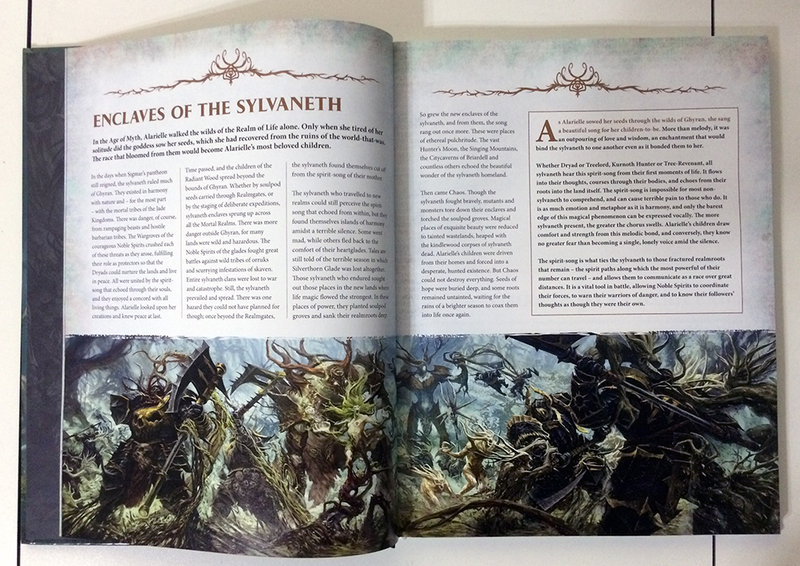 The Sylvaneth are divided into a number of glades, kind of like clans or tribes. The oldest of these is Oakenbrow, whose colors are shown above. Their are seven glades in total, but it mentions how new ones are still popping up. 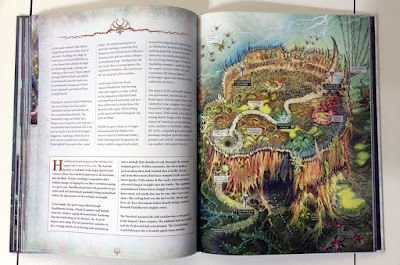 Besides just the color schemes we also get a brief description of each glade, with each having its own unique characteristics. For example, one is known to harbor a lot of the Outcasts, while another Ironbark, makes its home in Chamon and is known to be friendly with the Duardin. They also go over the general organization of each glade incase you want to collect it accurately. Next we get the individual unit descriptions which go into more depth. Alarielle gets her own section and then the rest is divided up into Noble Spirits, Forest Folk, Free Spirits, and the Outcasts. The noble spirits consist of the Tree-Revenants and Branchwyches. The Branchwyches are a new unit and are basically the dedicated wizards of the Sylvaneth. They are also responsible for harvesting the lamentiri after a battle. The lamentiri are the little glowing soul pods in most of the models. This contains their life essence and is replanted to grow a new warrior. Unlike the Stormcast the new warrior is not the same person (tree?). It's more like reincarnation, but where you retain a lot of the skills and memories of your past life. It reminds me a lot of the Eldar and their spirit stones actually. I really like this and how it gives the Sylvaneth a racial memory. The Forest Folk are the Dryads and the Branchwraiths, and like I said before, they were not meant to be warriors. Now though, due to Chaos, they are vicious and tough and not one to mess with. The Free Spirits are my favorites. They consist of the Sons of Durthu and the Kurnoth Hunters. 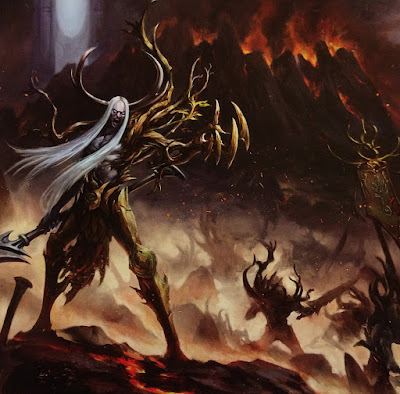 The Sons of Durthu are basically the descendants of the Durthu from the world-that-was. Alarielle replanted fragments of him and made a bunch of lesser versions of him who act as her personal bodyguard. They don't really have any idea who Durthu was besides that he was a great warrior and they strive to live up to his example. 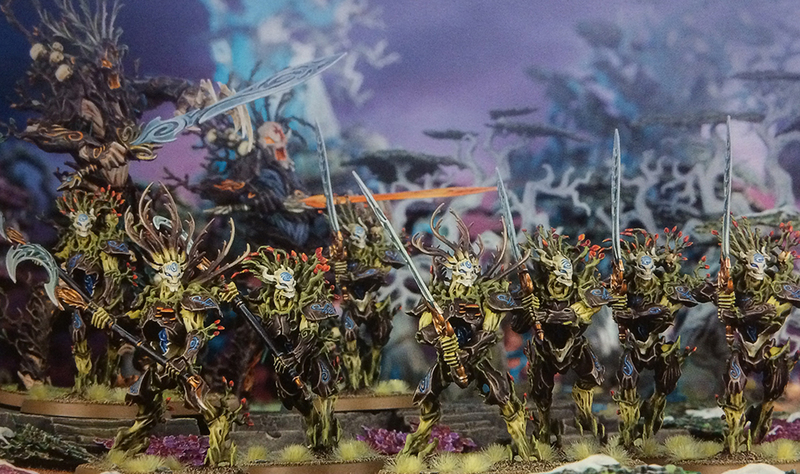 The Kurnoth Hunters are the new ogor sized Sylvaneth and are fairly new within the realms. They have only appeared since Alarielle's rebirth. What I really like about them, besides the fact that they look awesome, is that they worship Kurnoth, a deity they say as being Alarielle's consort. He's basically described to be a lot like Orion and I wouldn't be surprised if that's who he ends up being. This is also the first time we have seen a lesser deity mentioned and openly worshipped within AoS. The Free Spirits operate outside of the framework of the glades and answer directly to Alarielle. Last but not least we have the Outcasts. Here the Spite-Revenants stake their claim, the eviler looking version of the Tree-Revenants. They are basically Sylvaneth who have given in to despair and have forsaken the rest of the race. They are bitter and twisted and first appeared during the Shrouded Season. Most interestingly though is that they are led by non other then Drycha, now reborn within the realms. Alarielle held on to her soul pod, refusing to plant her, but when the threat of Chaos became to dire she gave in and planted the Outcast. She is just as crazy as she was in the world-that-was, and only cares about the survival of the Sylvaneth at the expense of every other race. She also gets a cool new plastic model. 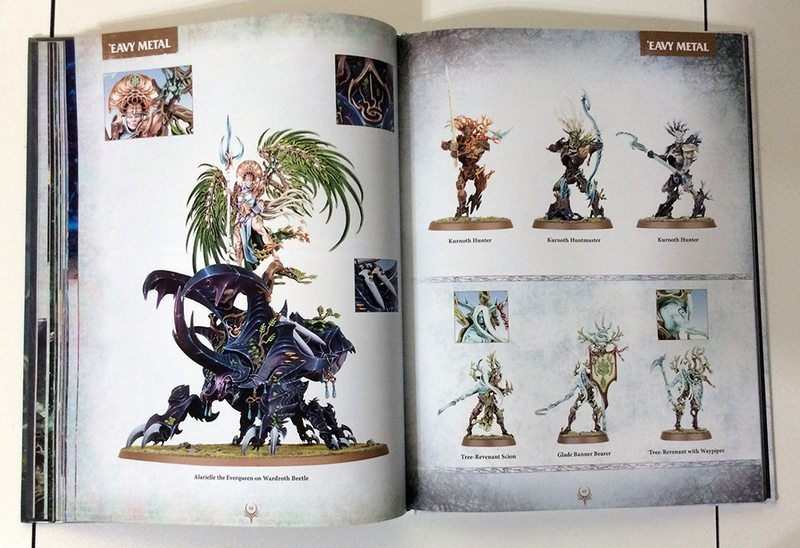 After all of the lore we get the painted minis gallery, with a bunch of shots of the studio armies as well as the 'Eavy Metal models. I really love these new models, they fit the aesthetic perfectly and are really cohesive as an army considering how old the Dryad sculpts are. I am really tempted to build a small Free Spirits force to fight alongside my Stormcast and maybe evolve into their own army. I mean, those Tree-Revenants are freaking sweet. Alarielle on her beetle is a great center piece and I think they captured the look of her perfectly. I can definitely see her as the avenging goddess that she is supposed to be. One cool bit of lore for her is that when she takes flight her beetles bursts into a bunch of motes of light which swirl around her until she lands, at which point it reforms into the massive beetle beneath her feet. Thats just plain cool and extremely cinematic. 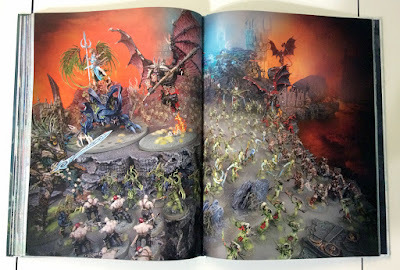 All of the artwork in this book has been just as good, if not better then what we have come to see from AoS publications. I feel like a lot of it has an aesthetic closer to the dark and gritty feeling we knew from older editions of Warhammer. It's not quite as cartoony and bright as some of the other AoS art out there. 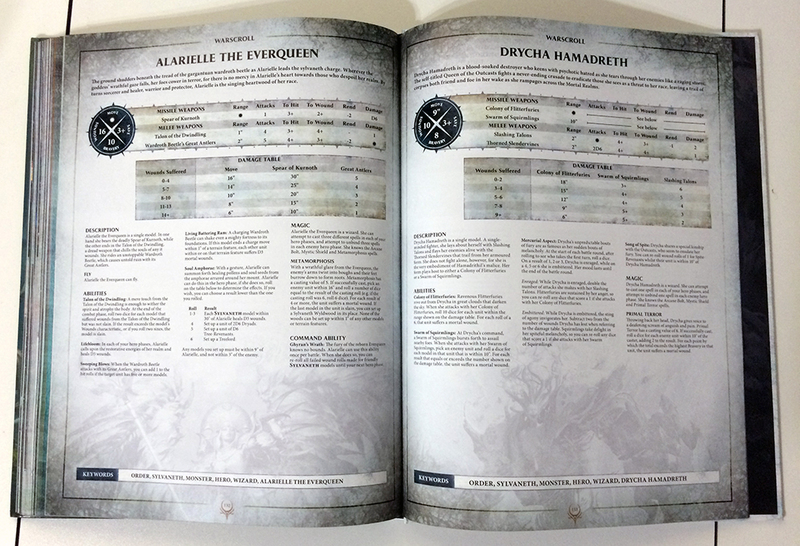 There are three battleplans included as well as a Time of War ruleset! 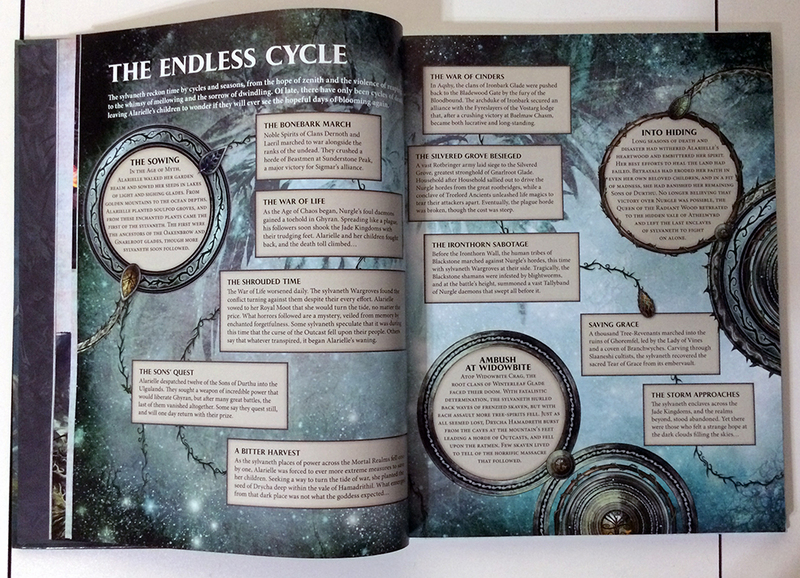 This is pretty cool that they are putting these rules into battletomes now too. 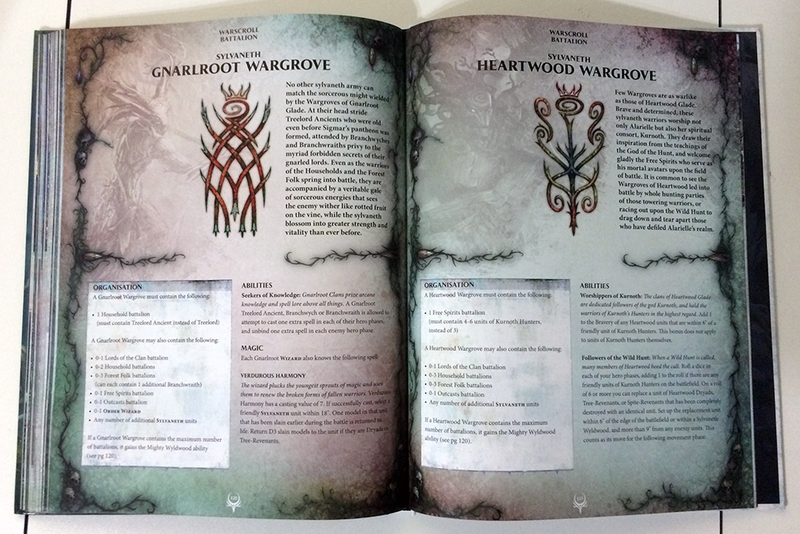 The Sylvaneth one focuses on fighting of glades of power, which comes into effect in the following battleplans. I hope they keep this up going forward, I would love to see more army specific ones like this. 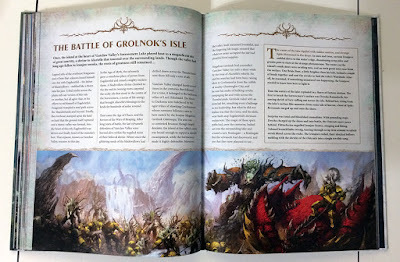 The first battleplan focuses on the forces of Nurgle attempting to claim the Great Stump from the few remaining Sylvaneth forces occupying it. There is a cool bit where they mention that the sky is constantly raining ash here because it's where the realms of Ghyran and Aqshy rub up against each other, kind of like tectonic plates. 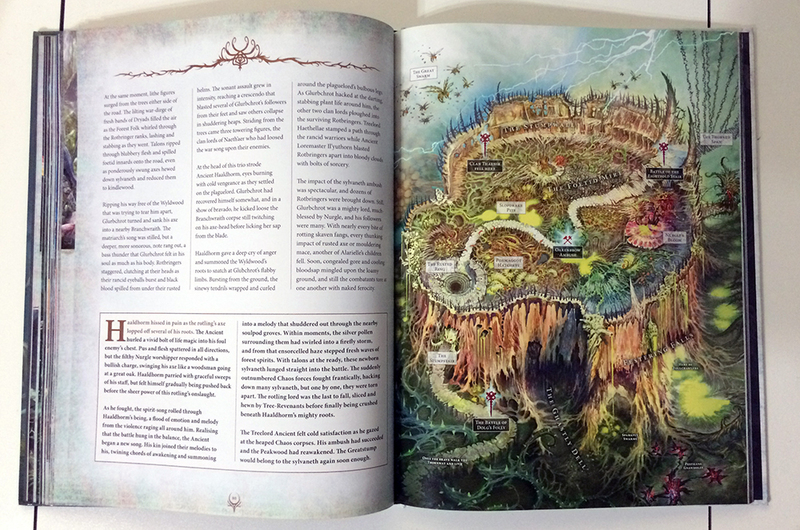 The battleplan itself, The Sacred Grove, revolves around the Sylvaneth attempting to rewake their sacred groves. This is represented by four Sylvaneth Wildwoods being deployed in the other player's deployment zone. 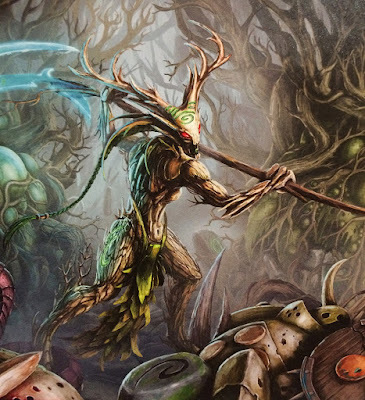 Each turn the Sylvaneth player can attempt to reawaken it. They also start out with only three units and gain more as the battle goes on. The Sylvaneth player wins if they can reawaken all four of the Wildwoods by the end of turn five. This is definitely an uphill battle for the tree folk, but looks like it could be a lot of fun. The second battleplan see the Ironjawz orruks attacked since they unfortunately made thier camp on top of an ancient Sylvaneth grove in Ghur. Drycha leads this assault along with her outcasts as they tear into the greenskins. She is just a distraction though, as the main Sylvaneth force infiltrates the once sacred grove and begins to reawaken it before the Ironjawz figure out what's going on. The battleplan, Awaken the Land, once again sees the Sylvaneth trying to stir a grove from its slumber. Unlike the last scenario the victory conditions rely upon the Sylvaneth player wiping out the opposing player. To help them with this each turn they can attempt to awaken the ancient power which hurts the opposing player and heals them. There are also some cool rules to represent the feint by Drycha. Overall this seems like it could be fun, but also runs the risk of being a bit of a meat grinder. I think it has enough cool and unique rules in it though to overcome this. I would have to give it a shot to really know for sure. The last battleplan see Alarielle going on the offensive, leading her Sylvaneth forces into Aqshy to take the fight to Chaos. She basically sweeps out through a realm gate and engages in a giant battle with a bunch of Bloodbound. 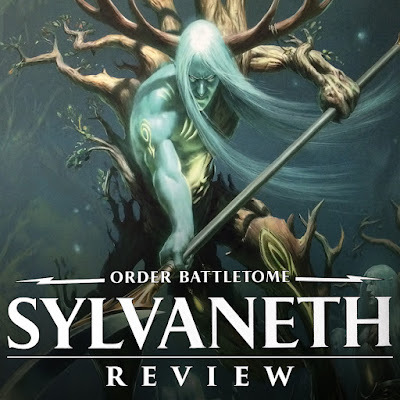 It's an entertaining story with a cool map and is basically meant to show nature's wrath and how the Sylvaneth are not just fighting to protect what's theirs. The battleplan, The Wild Hunt, is really cool in that it has the board divided up into six sections going the long way down the board. The Sylvaneth deploy at one of the short board edges while the opposing player takes up a larger deployment on the opposite side. To win the Sylvaneth player has to have extended their territory into the sixth and final section. They do this by clearing each section of enemy or at least making sure they are engaged. 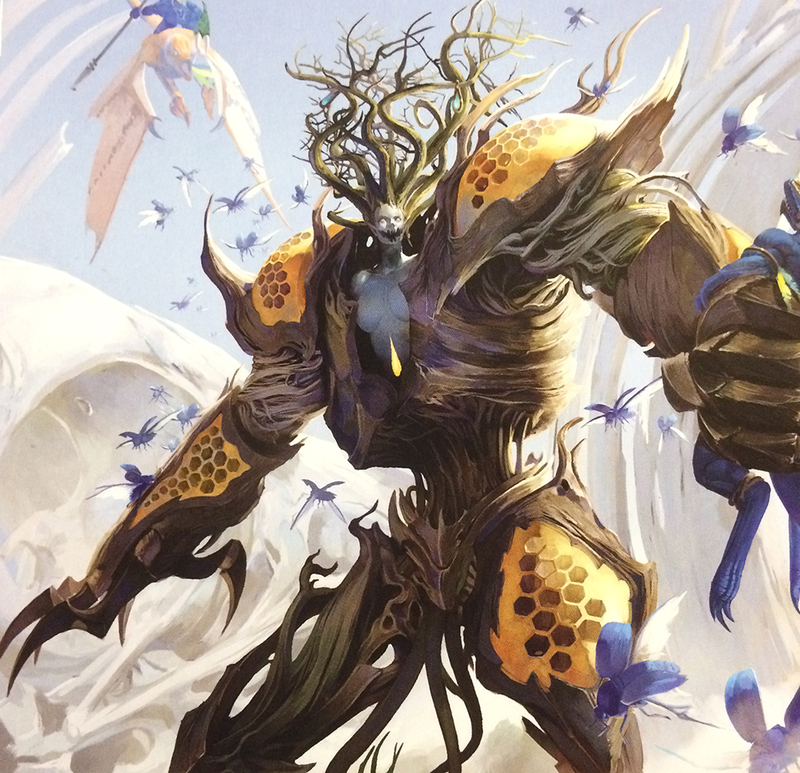 The Sylvaneth can also win if they have less then all six sections but their chances are lower the lower the number of sections that have. I really like the idea of this scenario since it shows the Sylvaneth sweeping the enemy before them in an endless wave of fury. I think this could work really well with any two forces. Now we get to the part that I am really excited about. 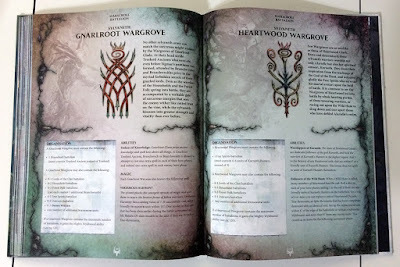 This is something brand new that so far only the Sylvaneth have, but based on some of the wording in here I think other factions will be getting this treatment as well. Alright guys and gals, here we go, army wide special rules, multiple command abilities, six different spells that you can choose from, magic items, and arcane items are back! You heard that right! The first part of it talks about your allegiance. If your entire army has the Sylvaneth keyword then you count as a Sylvaneth army. 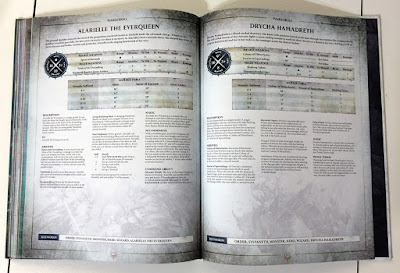 It also talks about how you could have an Order allegiance, but doesn't talk more about it which is what leads me to believe we will be seeing this with other armies. 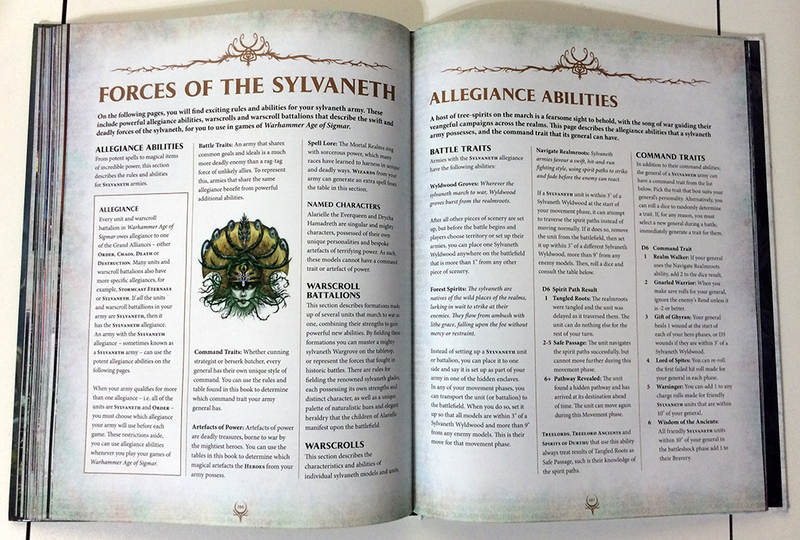 If you have a Sylvaneth allegiance then you have access to all of this extra stuff. It's basically rewarding you for sticking to a theme. If you just incorporate some Sylvaneth into your other army then you cannot use the extra rules here. There are six different command abilities that your general can pick from in addition to whatever else they have. You can also roll randomly for them instead of picking. I feel like the random roll is what matched play will utilize. There are also six magical artifacts, six arcane treasures, and six new spells, including a revamped Dwellers Below. Besides just the rules they all have a fluffy description of what they are, giving it lots of cool flavor. The army wide special rules you gain make your army a lot more effective too. I really like all of these additions and I'm sure these are going to be hugely popular amongst players. It gives you the sense that you can customize your army more like back in older editions. I really hope my Stormcasts get something like this. After that are the battalions, which have a bunch of the usual ones you would expect. 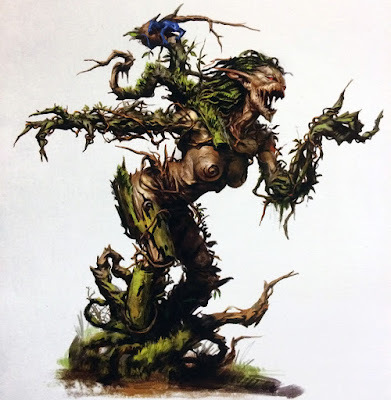 There is one for each type of Sylvaneth subfaction, such as a Forest Folk one with three units of Dryads and a Branchwraith. 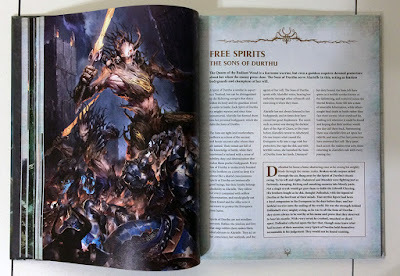 I really like the Free Spirits one which is one Spirit of Durthu and three units of Kurnoth Hunters. I think this may be what I try and build my force around if I do it. There is also the obligatory giant battalion that contains all of the other ones. Most exciting for me are a new type of battalion that you can see above. Each one is meant to represent a specific glade of Sylvaneth. So if you wanted to build and collect an Oakenbrow force you can, and if you follow the guide lines for the battalion then you get some additional rules. It seems pretty easy to build these too, with each one only requiring one of the smaller battalions, usually slightly modified, and then every other battalion is optional. 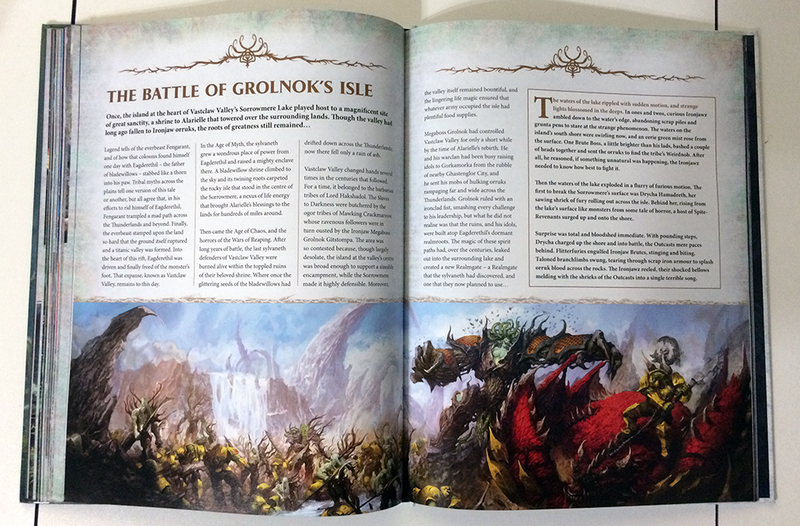 Some include non Sylvaneth forces, like the Ironbark one which allows you to take two Duardin units. I really like this idea and again, I hope they expand it to other armies. It would be cool if I got benefits for building my Stormcast to be a Hammers of Sigmar army. 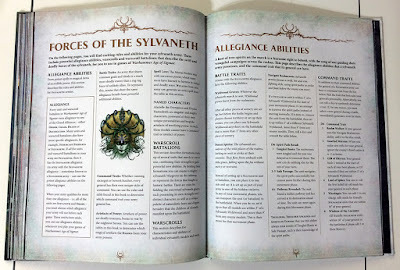 There is also a historical battalion to represent the events of Balance of Power with a mix of Sylvaneth and Stormcast, including Lorrus Grymn and the Lady of the Vines. Lastly we have the warscrolls themselves. These are kind of new too in that it more resembles what we were used to in 8th edition, with multiple units on the same page. They no longer have a picture of the unit above each set of rules. I think this is fine either way, but it's cool seeing them playing around with multiple formats. 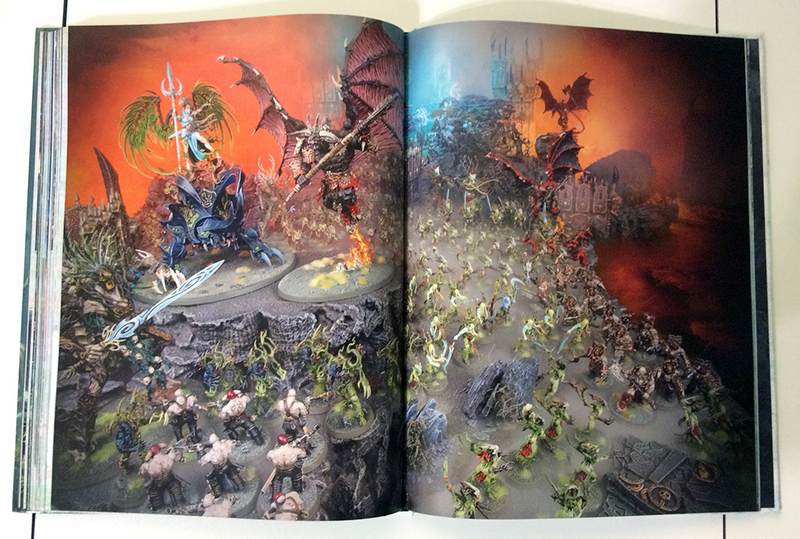 It definitely has a bit of a nostalgia factor in that it looks like an older army book. The Sylvaneth seem like a pretty powerful army with the Wildwoods playing a pretty huge part. Almost every unit gains some sort of benefit from being in or near a Wildwood. The whole thing wraps up with the four pages of rules and that's it. I really liked everything about this book. 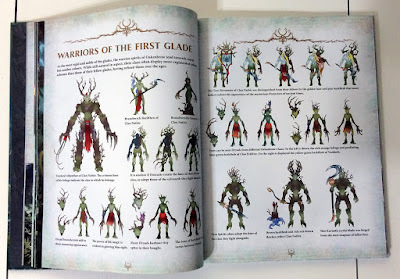 They did a great job of fleshing out the Sylvaneth as a believable race and army. I foresee these guys being very popular and what they were able to accomplish with this army and book gives me a ton of confidence that anything else coming out in the future should be awesome. 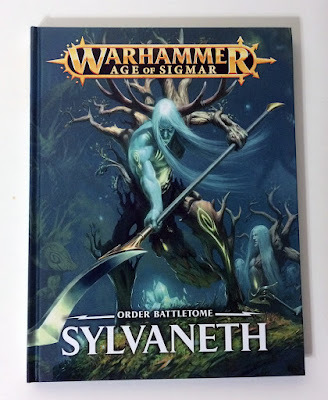 If you are interested in the Sylvaneth or even the Wood Elves of old then I think this book is a must by. You will be able to get all of the warscrolls in the App for free, but there is just so much quality lore, artwork, and additional rules in here that I don't see why you wouldn't buy it. This is the perfect army to kick off the Season of War summer campaign with. Even if you don't plan on getting this army, if you can afford it I would recommend picking up this book. 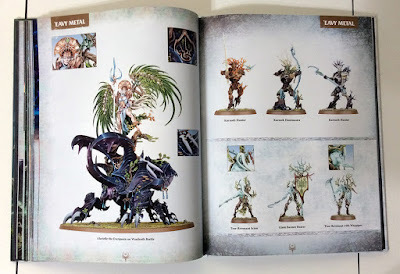 The addition of all of the new army rules, magic items, and spells and such is just too cool and I can almost guarantee that after you read this you will want to at the very least pick up a few Sylvaneth units. Final Score - 5/5 Unleash the fury of nature!